It is the intention for MμMα to be non-profit, and also to be permanent, and should be open to the public both by digital means and physical (eventually). However, from both of these definitions comes the concept of acquisition and collection, and this is my starting point for today. I have already one item in my collection, being a slide rule, which is a manual calculation item which was commonly used in schools up to the end of the 1970s, prior to the common usage of electronic calculators. 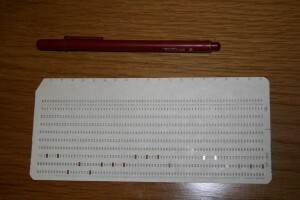 I have another items, also being donated to the museum from my own personal collection, being a punched card, which was used extensively in the early computer industry up to the mid-1980s. I have also many other items which are soon to be acquired into the collection. Accession 2014.1 : Slide Rule. what documentation should I implement to record the accession of the items into the collection? where should I put the items, given that I do not have a physical storage area at this time? I already have two different modes of accessioning which are happening from what I am doing and from my conservations with others. These are donations (in which I am donating items from my own collection or where others are donating items which they wish to find a home for) and purchasing (in which I am buying certain items which I believe will meet the collection development policy – see below). Whereas I am a completely digital nut, I am preferring to start my documentation using a manual system, and will later transfer this to our ETHER Base collection management system. This may sound a little strange – that I have my own collection management system and yet am starting life in the museum on paper! My justification is that I want these early paper records to be digitised and to form a part of the history of the museum itself, including paper-based transfer-of-title forms and object entry forms, and a paper-based accessions register. I have archival paper available, which we provide through our ETHER Conservation business unit, and I am printing our ETHER Accessions Register Template document onto this paper and will later be binding these Accession Register pages into books. These pages will also be scanned and maintaining digitally as well. Now comes another question, on how I should number the items which I am receiving, and also when an item should be considered as a single item and when it should be accessioned as multiple items. Let us look at the slide rule, which consists of the slide rule itself, and its container, which is in two parts which separate to open, and which combine to close up the slide rule. The slide rule itself also consists of the main rule, and the movable bar, which can be removed completely, and the hairline cursor, which is attached in a way that it cannot be directly removed. I have referred to the SPECTRUM Advice Note on Numbering, and also used my own judgement on a practical solution. Whereas we can use an internal computer-generated number, I am preferring to use a human generated number for now, using the simple scheme of YYYY.N where YYYY is the year of accession, and N is the sequence number within the year. So my first accession, being the slide rule above, is numbered 2014.1, and the second, being the punched card in the image below, is 2014.2. However, the slide rule is also divided into three parts, so whereas the full slide rule is seen as a unit, its parts will be numbered 2014.1.1 for the slide rule itself, 2014.1.2 for the larger part of the cover, and 2014.1.3 for the smaller part of the cover. the items may include computational devices (such as my slide rule), numeric storage (such as the punched card), measuring devices, shapes, teaching tools, and can also include more complex computing machinery (such as a mechanical calculator). all items should have sufficient provenance where this is possible, at least a document from the owner transferring title and other rights where appropriate. My next concern is where to store the items while I am finding a more permanent home. I work with a number of museums which small or starting life, and for which there is no permanent home, and storage is borrowed from others or is stored at home or at the office. Whereas this may be shock and horror for the professional museum community, I am certain that every single collection started life in someone’s home or their office and only when this became a serious collection was a home sought. All of the major collections started with a single item, and many did not start with a museum but just as a collection, which then was used to start the museum. I happen to be doing things the other way around, starting the museum, and then building up the collection as I go along. Given that some of the items I will be acquiring will be potentially valuable, I have decided to use a reasonable secure location for storage, but I will not tell you where it is, otherwise is will not be so secure, will it! Once a location is selected, then I need to determine how to pack and store the items. The slide rule does not require much conservation storage, since it is made of plastic and will probably be unaffected by the environmental conditions for at least the next million years. However, the punched card is more of a challenge, given that it is made of paper card and will fade and degrade over time. I am considering a photographic sleeve for this and I will consult with my conservation expert, Sholeen Sanker, the head of our ETHER Conservation business unit, for advice. As part of the accession process, I need to conduct and document a condition check, and also I need to complete the documentation of the Object Entry and the Movement records. I know that if I do not do this now it will become a future cast of Retrospective Documentation, and I do not want to find myself in this position with my first two accessions! I also need to begin the cataloguing process and to determine the suitable fields which will help to provide the right level of information, and which will provide a suitable set of finding aids once the collection becomes large. I have taken a simple photograph of each purely to document the accession process, and a digitisation strategy will be required as well as the museum expands its operations.